From Japan’s Meiji Period until the Showa Period (1868-1945), the Omori Kaigan Seaside neighborhood flourished as one of Tokyo’s representative hanamachi, geisha districts. In its golden age, the streets were lined with traditional Japanese restaurants, ryotei, and beautifully dressed groups of geisha could been seen fluttering in and out as they worked in the stylish neighborhood. The Yoshinoya geisha house has existed in the Omori and Oimachi area since that golden age. The geisha of Yoshinoya spend their days diligently studying traditional Japanese dance, tea ceremony, and Nagauta shamisen. It is our hope that we can share the beauty of Japanese tradition with you. My daughter and I were visiting Tokyo and wanted a truly traditional Japanese experience that didn't make us feel like "tourists". If anyone out there is wanting a similar experience, look no further! You have to work this in to your schedule somehow! Our geisha spoke English, but her demeanor was what we expected of a true geisha. It was perfect combination for us because we really were curious about the ceremony and the traditions and she was able to explain everything fully to us, while still maintaining her presence as a a geisha (btw, she was a registered geisha). Our Tea Master personalized our ceremony especially for us (including a tea which was in line with our taste). Can't say enough good things about this tour! My two children (ages 5 and 6) and I had a lovely time at the Tea Ceremony with Geisha Dance. Being the only guests that day it was intimate and comfortable. Kimicho had both my children talking near nonstop only a short time after meeting us at the train station. 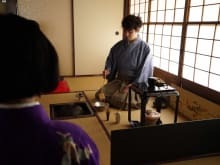 We were taught the formalities of the tea ceremony and were encouraged to ask questions (in the case of my kids, they asked LOTS of questions and all were answered). The kids enjoyed whisking the tea while they were learning to make it. We would highly recommend this to anyone wanting to have a closer experience of both Geisha dancing and tea ceremony. I asked the kids if they enjoyed it - my son (6) said nodded while my daughter (5) gave it two thumbs up. For my part I found it both interesting and relaxing ... towards the end it felt like we were talking with good friends. Highly recommended.